The authors of this report provide the following information (paraphrased). The retina has a highly complex, sophisticated structure, and even a minor perturbation may cause devastating visual impairment. Upon engaging with danger signals, the microglia may convert from a resting surveillance state to an active form, specialized to operate within the diseased environment. Evidence suggests that microglia in the aging retina appear to be activated at low levels. The function of these cells is unclear, but their location suggests that they may be “gatekeepers” of the retina. Aging is associated with a low-grade activation of the systemic immune system, and the term inflammaging is frequently used to describe this phenomenon. Increased inflammatory gene and protein expression has been observed in various models of retinal aging, and activation of the retinal immune system may contribute to age-related retinal para-inflammation. There are two types of inflammation induced by microglia in the eyes: para-inflammation, which is beneficial, and dysregulated para-inflammation that is detrimental. A healthy immune system should initiate an effective para-inflammatory response and keep it under control, as part of a healthy aging eye. If the level of retinal stress exceeds the repair capacity of the immune system, then tissue damage is unavoidable. If the low-grade para-inflammatory response becomes dysregulated, then it may transform into chronic inflammation and contribute to tissue damage. 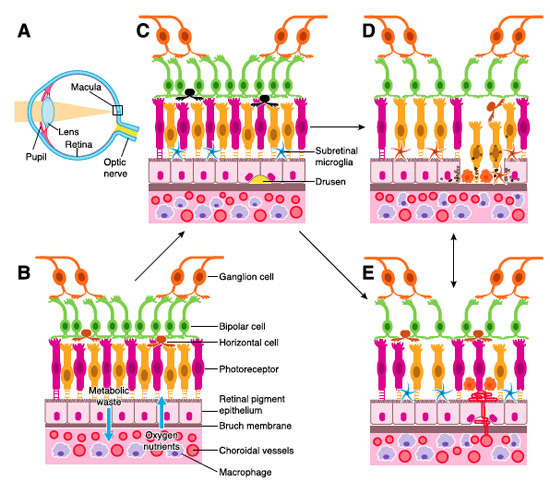 The subretinal space is devoid of any immune cells under normal, healthy conditions. The presence of microglia suggests tissue insult/damage at the retina-choroidal interface. Microglia can migrate. When these microglia (macrophages) are recruited to the subretinal space (see diagram below) in the aging eye, they may do more harm than good. As immune cells are recruited to the macula in the aging eye they may contribute to macular damage by producing various pro-inflammatory proteins (called cytokines and chemokines). A = Diagram of human eye. Light passes through the pupil and is focused by the lens onto the macula, the visual center of the eye. B = The retina is organized into three layers of cells (light receptors comprised of rods for night vision and cones for color vision, and cells (called bipolar and ganglion cells) that transmit signals to the brain via the optic nerve. These sensitive nerve cells are separated from the blood supply (choroid) by a thin saran-wrap-like membrane called Bruch’s membrane and a single-cell layer of cells called the retinal pigment epithelium (RPE) that facilitate passage of oxygen and nutrients to the photoreceptors and exit of cellular debris. C = Early stage of macular degeneration characterized by deposition of cellular debris (called drusen, observable during an eye exam as yellow pigments at the back of the eyes) and assemblage and migration of microglia underneath photoreceptors (rods and cones). D = a more severe form of retinal degeneration where light receptor cells and RPE drop out and die off, called geographic atrophy. Macrophages (immune cells) infiltrate. E = invasive macular degeneration where new blood vessels (called neovascularization) are abnormally formed to deliver oxygen to a starved retina. This invasion of choroidal blood vessels results in hemorrhage and damage or death to light receptor cells. Permanent vision loss may result. What causes microglia to convert to their activated destructive state? Natural metal chelators reduce microglial activation and inflammation. Three natural molecules, resveratrol, quercetin and vitamin D3 are documented to inhibit destructive activation of microglia in nervous tissue. It should be added that exposure to the blue spectrum of sunlight also activates microglia. [Advances Experimental Medicine Biology 2012] Habitual use of blue-filtering sun lenses during outdoor daylight hours would also be wise. ©2015 Bill Sardi, Knowledge of Health, Inc. Bill Sardi has a commercial interest in dietary supplements.